Giuseppe Concone, Gaetano Nava, Giovanni Lamperti, and Alan Raph. Trombonists have long recognized the importance of practicing and performing works that emphasize lyrical, expressive playing. Principal among this repertoire are the three volumes of Vocalises of Marco Bordogni, which are available in numerous adaptations for tenor and bass trombone as well as for tuba. The present work is a compilation of vocalises including 19 by Concone, five by Nava, and two by Lamperti. 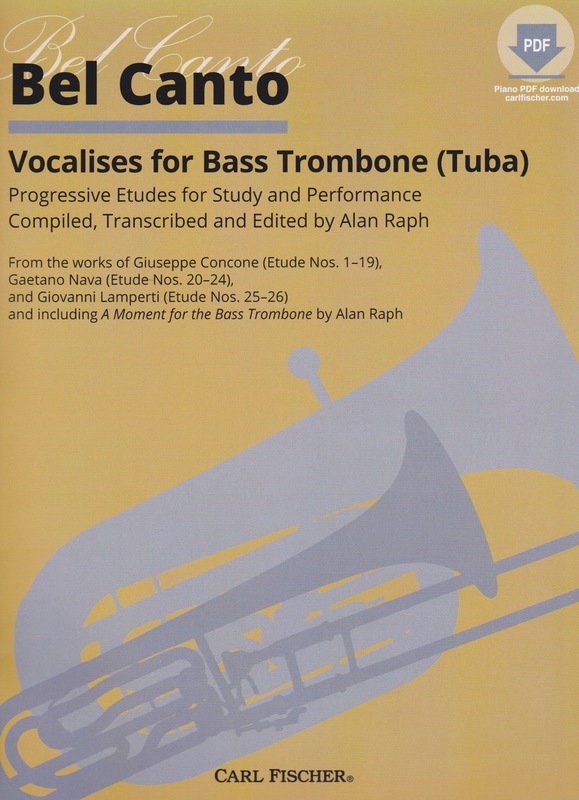 Progressively arranged by Alan Raph, these mostly legato etudes feature a range that barely reaches the top of the staff (b) but often ventures to the bass trombone’s lowest register (EE). Piano accompaniments to all of the Vocalises are provided through a free download on Carl Fischer’s website. This was not easy to find so here is how to do it: Go to carlfischer.com. Once there, create an account with Carl Fischer (free), search for the title of the book, then click on the title of the book, and finally click on the “registered media” tab. Once there, the reader will be asked a question about the location of a word in the book to prove one owns the publication after which the download will commence. These are moderately satisfying studies, as they are not nearly as musically interesting as those by Bordogni. They are presented without much editorial comment, but for music intended to be played with a piano accompanist, measure numbers would have been a helpful addition to both the solo and piano parts, and there are a few misprints. For instance, the first note for bass trombone in measure eight of Vocalise 18 should be AA-natural, not FF-sharp. Too, the inclusion of Raph’s own very twentieth-century composition, A Moment for the Bass Trombone, seems a bit gratuitous in a book of nineteenth-century Italian lyrical studies. Still, the book is well laid out, easy on the eyes, and helpful for players looking for low-register lyrical study material in a variety of keys by composers other than Bordogni.